Image Size 15" x 11-1/4"
Overall Size 17-1/2" x 14-1/2"
"A Still Life is something I have always wanted to do. Partly as it represents one of the most important English art forms and partly for the challenge of painting different materials like leather, rubber, paper & glass. 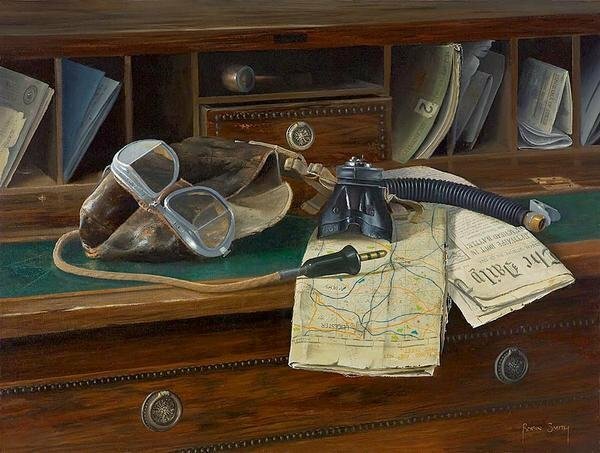 I thought the writing desk was a suitable backdrop to the composition as it is synonymous with the completion of a successful mission and a well earned rest period for the aircrew member. Indeed, I would like to do a Still Life of Barnes Wallace's draughtsman/designer paraphernalia on his well used desktop. Watch this space."